GoldenTyre is a 30+ year-old Italian company that makes a variety of tires, tubes and similar products for motorcycles, scooters and even vintage cars. 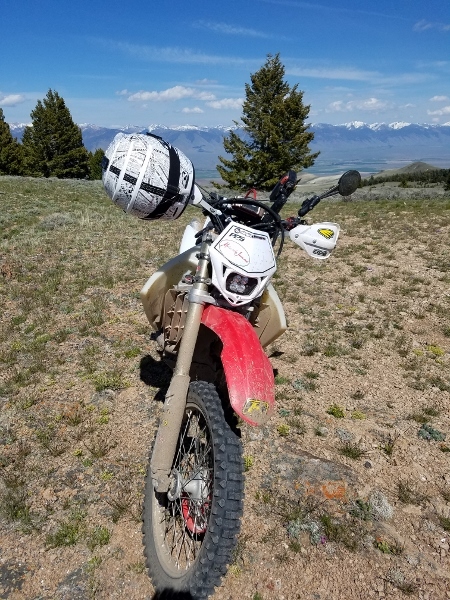 The buzz over Golden first reached me during 2015 when a few prospective riders on Tour of Idaho forums announced that they intended to use GoldenTyres. GoldenTyres were rumored to be to enduro tires what sticky rubber was to climbing shoes back in the 1980s, i.e., magic. Unfortunately their relative scarcity in the USA kept me from finding out for myself for longer than I would have liked. The first time I was able to get my hands on a GoldenTyre was at the 2016 King of the Motos when Jimmy Lewis had a pile of Enduro GT 216 fronts for course workers. I noticed that a number of the competitors who rolled through my checkpoints at that event were on GoldenTyres. That, in and of itself, is a strong endorsement. GoldenTyre West provided MoJazz with a few tires for review at a discount. After a few months on the soft terrain Enduro GT 216 front and rear I’m impressed. The 216 front is available in an oversized (90/100-21) footprint that makes for the best front tire I’ve used for general technical terrain. Bump compliance, traction, tracking and wear are all outstanding. 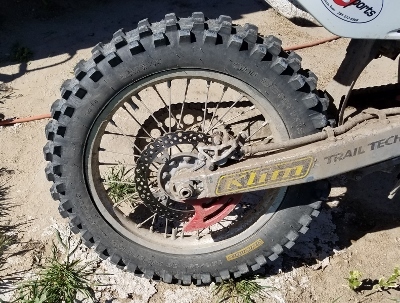 I was concerned with how well such a compliant tire would last but so far it’s showing little wear after sorties in the deserts of Nevada, California and Idaho and some very rocky rides in the mountains. 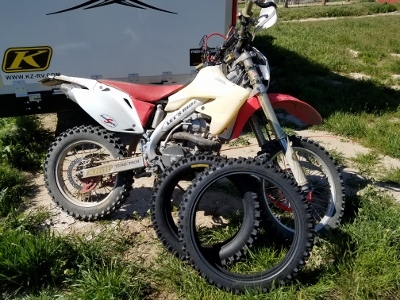 It's currently my go to front tire. The 216 rear is just as good - though not a tire that anyone would consider long-lasting. You'd never, for instance, get it through a complete Tour of Idaho. The Enduro GT 333 rear will need to a few more miles before I can form a definitive opinion but so far it appears to have most of the grip of the 216 with a lot more wear. GoldenTyres are very much worthy of consideration for all but really high miles. Highly recommended. The Good: Super compliant and sure-footed. The Rad: The bigfoot front tracks so well that it takes getting used to. The Gnarly: The 216 rear wears pretty fast - but you'll love it while it lasts.